J.D. Power’s latest survey of Canadian wireless consumers reveals Telus and Vidéotron customers report the highest overall network quality. The marketing information services company conducted its study online in English and French, reaching 15,021 respondents in September and October 2016 and March 2017. 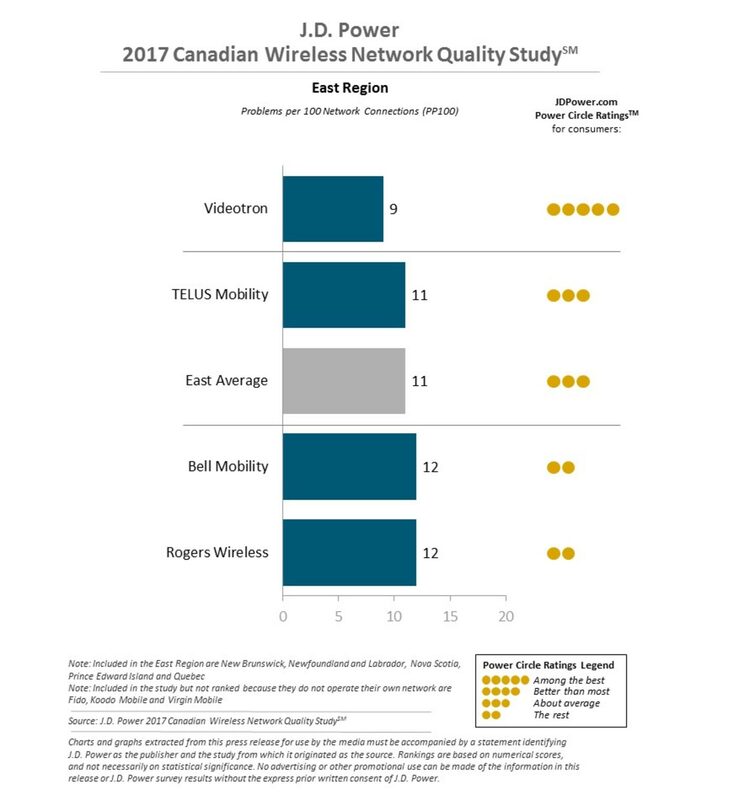 In both Ontario and the West, Telus ranked highest in overall network quality, while Vidéotron ranked highest in the East. 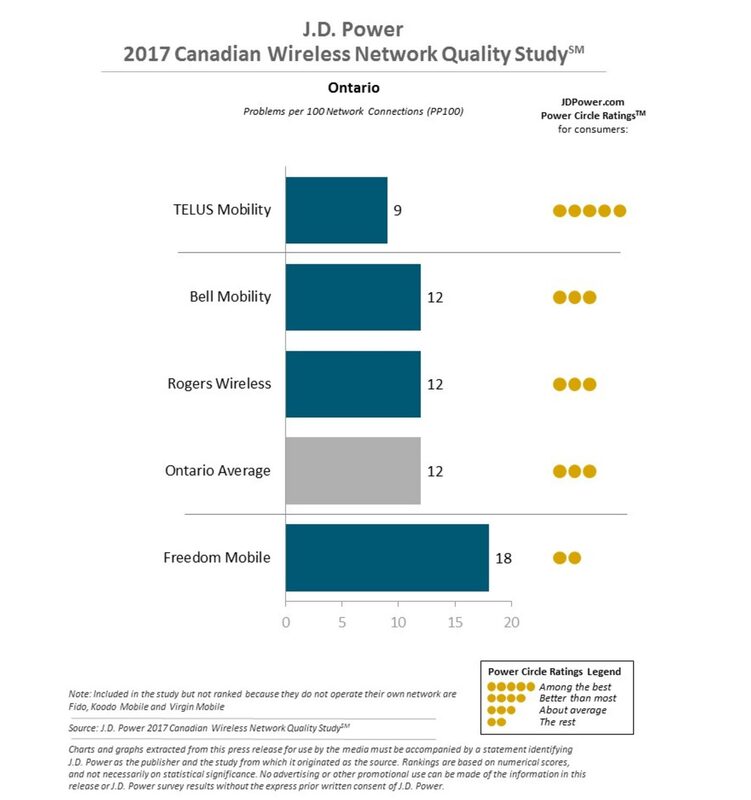 In Ontario, Telus came in at 9 PP100 with Bell and Rogers tying for second with the regional average score of 12 PP100. In the West, Telus retained its score of 9 PP100 followed closely by SaskTel at 10 PP100. In the East, Quebec-based carrier Vidéotron came in first place with 9 PP100 and Telus took second place with 11 PP100 — the region average score. Additionally, the study noted that heavy users of wireless service in Canada cite higher incidences of network problems (an average of 14 PP100 compared to medium users’ 12 PP100) and that younger customers also experience more network issues, with the 18 to 34 demographic citing 14 PP100 compared to 12 PP100 among those 35 to 44. Somewhat intuitively, the study also revealed that heavier users have higher data allowances and monthly bills — an average of $104 CAD versus $93 for medium users and $76 for light users. The results are measured in problems per 100 connections (PP100) and the study includes seven wireless carriers in the East, which comprises New Brunswick, Nova Scotia, Newfoundland and Labrador, P.E.I. and Quebec; seven wireless carriers in Ontario and nine wireless carriers in the West, which comprises Alberta, B.C., Sasktachewan, Manitoba, Northwest Territories, Nunavut and Yukon Territory. The results are restricted to carriers, unlike Fido, Koodo and Virgin, that do not operate their own networks, but rather use the networks of their respective parent companies, Rogers, Telus and Bell.